On her European Grand Tour she was enthralled by the musical offerings and was taken by the charm of festivals such as the Salzburg Music Festival. 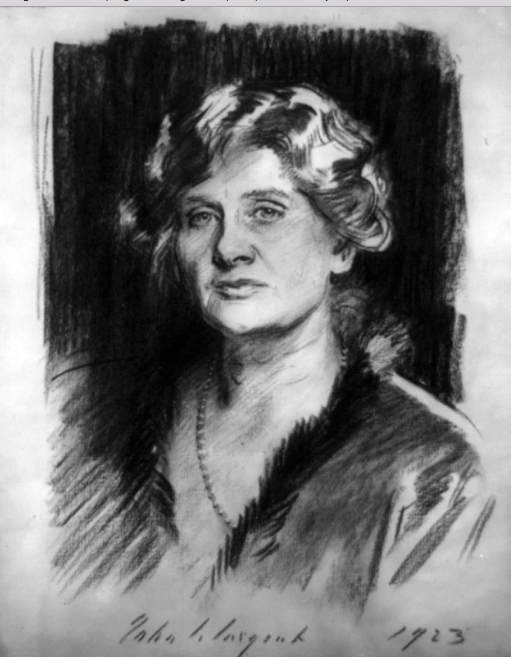 She married Boston born physician Frederic Shurtleff Coolidge who left his Chicago practice and moved to Pittsfield for his health. They had one child, Albert (who would accompany his mother’s piano performances on the viola). 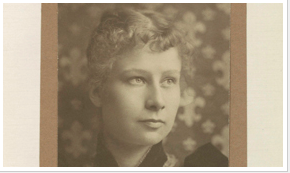 Her husband died in 1915 and her parents shortly thereafter. She inherited a considerable amount of money which she used to embark on a promotion of chamber music, a mission she continued to carry out until her death at the age of 89 in Cambridge in 1953. Although marked by tragedy, this change of circumstance must have helped Elizabeth liberate herself from the constraints of her Victorian upbringing. In 1916, she agreed to subsidize Chicago Symphony Orchestra violinist Hugo Kortschak (1884–1957) and his string quartet provided they would move to Pittsfield. 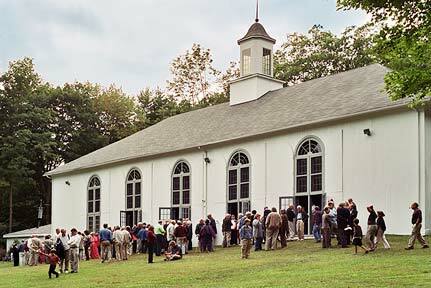 The Berkshire String Quartet—Coolidge’s “Berkshire Boys”—became the nucleus for her Berkshire Chamber Music Festivals. 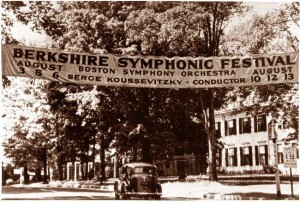 She built a summer colony for them, with a performance venue known as the Temple of Music, and established a composition award, the Berkshire Prize, for new The Berkshire Chamber Music Festival ran from 1918 to 1924 annually, and thereafter occurred at irregular intervals in 1928, 1934, and 1938. Along with standard chamber music literature, the Festival highlighted Coolidge-commissioned and prize-winning works from the associated Berkshire Chamber Music Competition. During its two decades, the Festival generated 1,284 new works, and attracted prominent composers and performers. 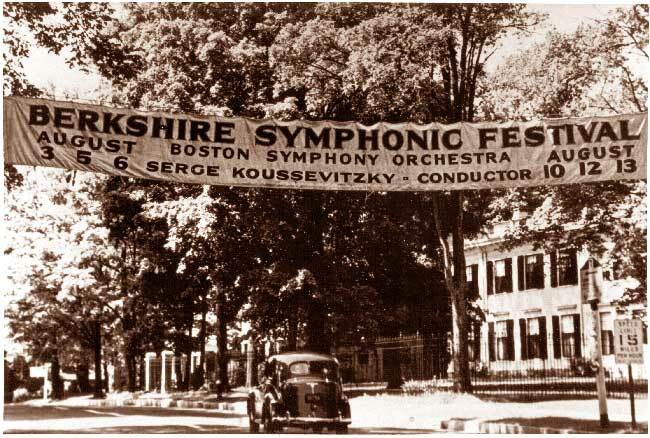 When the much larger Berkshire Symphonic Festival got underway in the 1930’s, they must have recognized the credibility Mrs. Coolidge had established for the Berkshires. They named her honorary president. 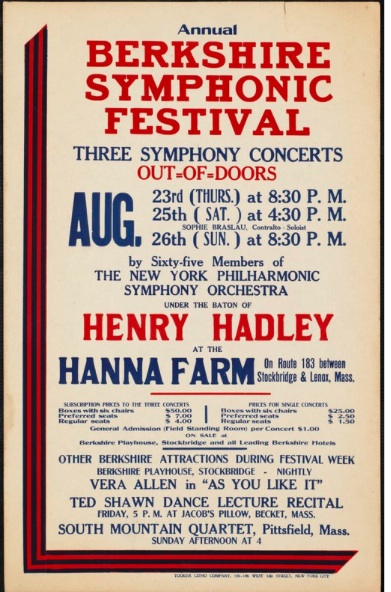 A spark for further development arrived in the form of Henry Hadley, a composer and conductor enchanted with the idea of an outdoor music performance under the clear starry skies of the Berkshires. He was (fortunately) directed to Miss Gertrude Robinson Smith and Mrs. Owen Johnson of Stockbridge. They, and Mrs. William Fulton of Great Barrington, managed to gain enough local support to pull off the first festival – in what must have been a very challenging time to take the risk of attracting sufficient patrons from New York and Boston. Residents of Stockbridge, Lenox and Lee provided funds and labor for building stage benches and an acoustical shell with the help of Emergency Relief workers. With the use of Dan Hanna’s horse ring, they, miraculously pulled it off. 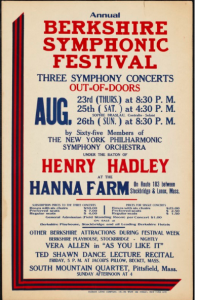 Henry Hadley had trained and directed 65 members of the New York Symphony Orchestra who performed August 23, 25 and 26, 1934. 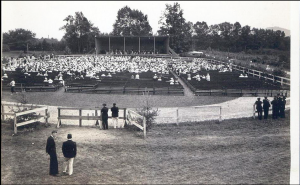 Seating had been constructed for 2,000 and the attendance for all three concerts was estimated at 5,000.